"Christmas time is finally here. 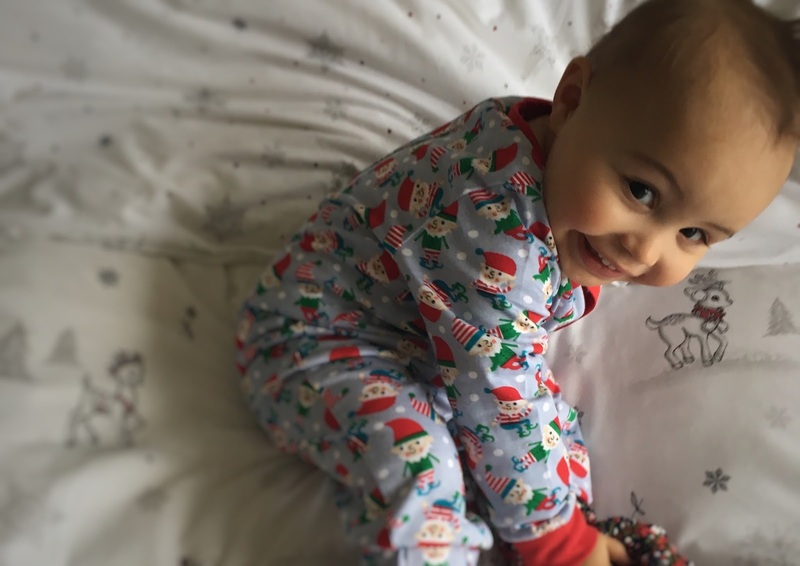 To those we love and hold so dear"
It's not Christmas without dressing up your Little Monkey's in novelty pyjamas and taking a billion pictures on your camera phone. You can't possibly welcome in the spirit of the festive season in just any old nightwear, I bet even the baby Jesus rocked a red onesie. So when it came to looking for adorable sleep suits, the gorgeous girlies at Very presented me with these super cute Mini Elf Printed pjs from Mini V by Very. Mini V is Ladybird older toddler brother and I have to admit it, he's got a little swagger. Alongside the sleep suit you can also get matching Novelty Vests that come in a pack of three. But what got me excited was the Mini V Popcorn Cosy Socks. I've saved the little Reindeer pair for Christmas, however I couldn't resist popping Henry into the little multi coloured ones. These little snugglies kept Henry's little piggies warm whilst he watch Peppa pig on my bed. The things you do for a picture.